Author: David Stearns; Format: Paperback; ISBN: 9780071545327; Publisher: McGraw-Hill Books; Release Date: 2008; List Price: $14.95; Length: 102 pages; Edition: Revised. Condition: Like New. Cover is in great shape, and binding and pages are pristine. Same cover design as that shown here. Each book in the Opportunities In... series offers: the latest information on a field of interest; training and educational requirements for each career; salary statistics for different positions within that field; and up-to-date professional and internet resources. Get started in a position that has a future and is financially rewarding. 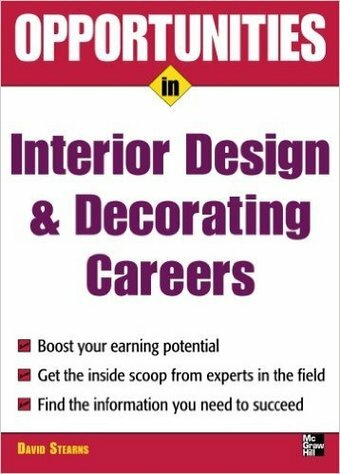 Opportunities in Interior Design and Decorating Careers provides you with a complete overview of the job possibilities, salary figures, and experience required to enter the field of interior design. Priority Mail delivery for this item costs $7.00 at the request of a buyer. Otherwise, the shipping rate given here applies to orders shipped via Media Mail within the U.S. only. Orders consisting of multiple purchases packaged together ship by any of these delivery methods at a discounted rate, usually for only $1.00 per additional item plus the shipping fee for the first item (determined to be the one with the highest delivery charge). International buyers: please contact us with your destination country for applicable base shipping rates. Multiple purchases that are packaged together save shipping costs for you, too! Inquiries from all shoppers are responded to promptly and courteously. Buyers are encouraged to ask questions prior to placing orders, as all sales are final unless the product you receive differs significantly from that which was advertised here in terms of either the product itself or its promised condition. In other words, “buyer’s remorse” does not qualify for a refund. Exceptions are made only in the event that a buyer is willing to return at his or her own expense an unopened, BRAND NEW item for a refund of the original purchase price only. No original shipping costs will be refunded, unless we are at fault for sending you the wrong item or misrepresenting the product and/or its condition. This hasn’t happened yet, but if it does: you are guaranteed a refund of the purchase price, the original shipping fee, PLUS the cost to ship the item back to us.